After the current Textile Future Forum initiative concluded in August 2017, Textiles Scotland caught up with the nine projects who were supported by TFF to create innovation in textiles. TFF Programme Manager Gillian Wishart said, "TFF has enhanced innovation in the textiles sector through collaboration with Higher Education Institution partners. The TFF funded projects have resulted in exciting developments and supported transformation in smart textiles, advanced materials and critically, resource efficiency and re-use of waste to enhance productivity. TFF acknowledges the significant support SFC has given TFF." Click below to find out more about each of the projects. Can you explain a little about yourself and your background? I am Lisa Macintyre, from Heriot-Watt University’s School of Textiles and Design. I have a PhD in medical compression textiles for the treatment of hypertrophic burn scars and a BSc in Textile Technology. I have been a lecturer and researcher in textile technology with a particular focus on knitted textiles, and physical testing of textiles and product development for function for the last 20 years. Before that I had experience in testing functional textiles for the Ministry of Defence and completed the John Lewis graduate training programme and spent some time as a staff trainer for the John Lewis partnership. Can you explain the project you have received Challenge Funding for? I led a project that was funded by the Textile Future Forum to undertake a collaborative project with the Moredun Institute, JD Wilkie and Lella Cherrie (fashion technologist and product developer on this project). The Moredun Institute presented a problem in that during the course of their normal research activities (to develop medicines and vaccines for cattle) they need to collect fresh and untainted samples of poo from calves. They traditionally do this by attaching a harness made of straps to the calf, and suspending a bag from the harness to collect the poo as the animal defecates. The harness they had was complicated and difficult to fit and the collection bag was not fitted close to the animal. This led to sample loss and considerable mess as well as occasional discomfort for the animal. We developed a new product that was considerably easier to fit to the calf, with much improved comfort and better fit that will minimise sample loss, reduce health and safety issues and maximise animal welfare. We developed the new product in conjunction with JD Wilkie, who will be the manufacturer of the product under licence. Why do you believe the textiles industry needs the project you are working on? The textiles industry can benefit from projects like this one as niche technical projects increase the product portfolio of the company thus increasing business opportunity and safeguarding jobs. We (in Heriot Watt University) are able to develop the project with the company; helping to do evaluations that they have neither time nor equipment to undertake within the business. We are also able to develop robust experimental designs to ensure that objective product evaluations are undertaken, providing useful information for publication and marketing material. What have you managed to achieve progress on since you were awarded the Challenge Fund? We successfully evaluated a range of materials and existing products in order to ensure that the materials used in our newly designed calf jacket and ‘bovine bumbag’ system for collecting faecal samples (poo) are as durable and suitable to the end-use as possible. We replaced the complex harness system with a comfortable, breathable, adjustable calf jacket (available in 2 sizes designed for different ages of calf). This calf jacket is significantly easier to fit on the calves reducing any stress put on the animal and making fitting time more efficient and pleasant. The calf jacket is fully washable at high temperatures ensuring that harmful organisms are killed in the washing process. We re-designed the bag for sample (poo) collection and the new bag fits very closely to the calf’s rear in such a way that chafing under the tail should be minimised or eliminated, and the percentage of the sample that is collected should be significantly increased. 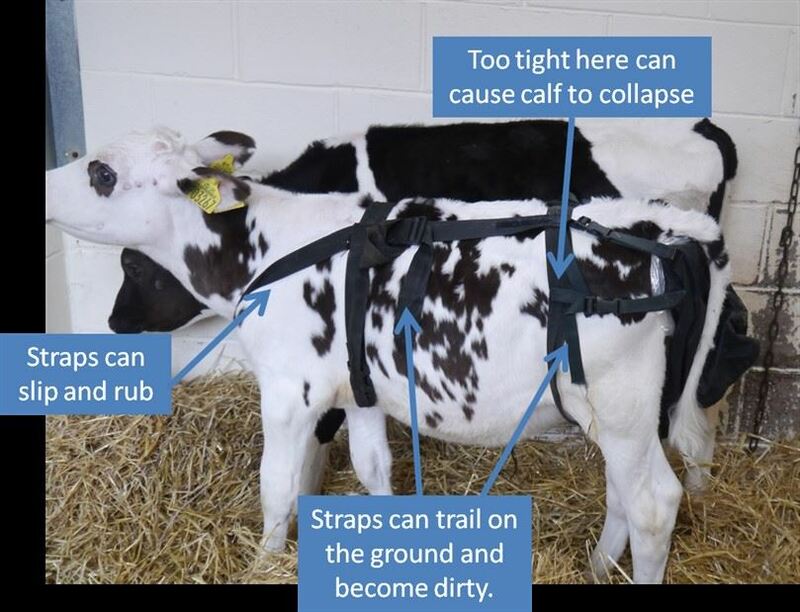 This means that the calves will not have to wear the jacket and ‘bumbag’ for as long as they previously had to wear the harness and the person collecting the samples should be able to do so without contamination or mess. What impact has your project had, to date? The project has led to significantly improved products for the collection of faecal sampling and these are already being used on projects at the Moredun Institute. Once design protection is in place this will be licensed to JD Wilkie for manufacture and made available to other research institutes. 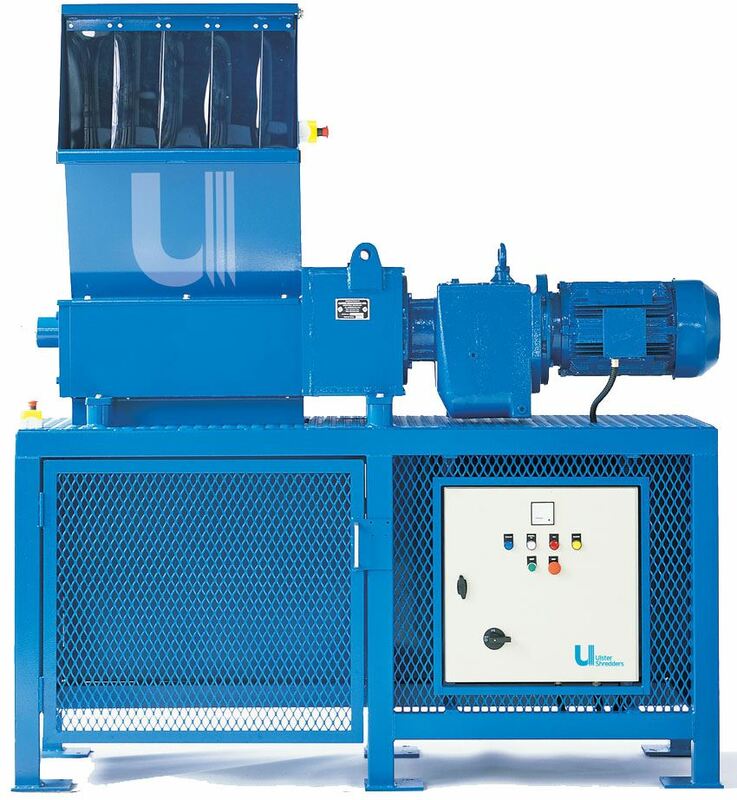 There is considerable interest for this product around the world. 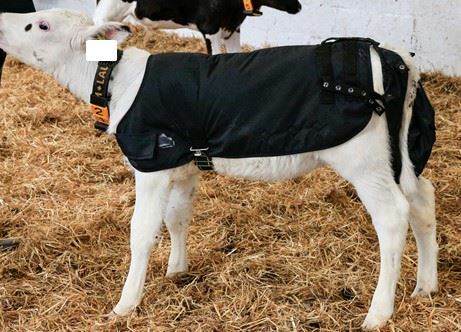 The product will never be manufactured in very high volumes but there is a significant niche market for this product and due to the enhanced testing of the materials in the development of the calf jacket it may find application in other animal husbandry products. What does the future look like for your project? What are the next steps? The next steps for this project are to finalise the design protection and licencing agreement. I am Dr Samantha Vettese. I am a Reader in Applied Art and Design with eleven years of experience in Higher Education and seven years as an award-winning jewellery and metalwork designer. My research is wide-ranging in approach; encompassing diverse areas of art, design and heritage with a particular emphasis on digital craft. My grant funding and awards total over £150,000 and I have published a number of peer reviewed journal and conference papers. I am a Fellow of the Higher Education Academy and deliver high quality teaching and learning in visual, critical and contextual studies for multi-disciplinary, under and post graduate design students. In 2010 I was awarded the Graduates Teaching Prize for lecturer of the year and was nominated for the 2010 Teaching and Learning Oscars, ‘Guiding Hand’ award at Heriot-Watt University. I was appointed as external examiner for the BA (Hons) in Fashion Communication at Southampton Solent University (2013 – 2017). I have been recipient of several prestigious prizes as a practicing jeweller including the Platinum Awards and the Goldsmiths Metal Bursary in 1990 and the New Designers/Goldsmiths jewellery prize in 1991. After receiving my first degree, I spent a year as ‘artist in residence’ within the Jewellery and Silversmithing department of Edinburgh College of Art. I have exhibited extensively throughout the United Kingdom and my work in platinum and gold form part of the Museum of Scotland’s permanent collection. We have created a 3D printable material utilising textile waste with PLA bioplastic, working with four Scottish industrial partners. We created a new use for textile waste in a format not normally associated with the traditional textile industry. We created what we set out to achieve. At this time, we have created innovation. Other societal, local and commercial benefits are still to unfold. We are continuing work with two of our industrial partners so far, on projects more specific to their company needs. We have also been approached by several small Scottish companies to apply our general expertise to their outputs. We are looking at creating a spin-out company and patent. I am Alan Shaw, Industry Coordinator at the Centre for Advanced Textiles (CAT), the Glasgow School of Art. I originally came to the Glasgow School of Art from Northern Ireland as a student to study Printed Textiles (BA and MDes). Earlier in my career, I worked in the textiles industry, including four years in a print production role with Timorous Beasties. I was then involved in the formation of CAT in 2000, and I continue to manage the centre, which serves as an educational facility, an R&D centre to explore the innovative potential of digital textile printing, and a commercial service bureau that undertakes printing for companies and design practitioners. We received Challenge Funding to work with the Alex Begg division of Moorbrook Textiles on a project with two main objectives. Firstly, to investigate how to print digitally to a very high standard onto cashmere fabric, and to test the combinations of pre-treatments, ink systems and equipment that would allow this. Secondly, to scope the feasibility of developing an online ordering system that would support bespoke, personalised designs, and (a degree of) automated production, using digital printing. At CAT, we have expertise in digitally printing onto various wool fabrics for specific and niche products and markets. A company such as Alex Begg produces very high quality products in significant volumes for some of the leading brands in the world. However there still seems to be limited capacity in Scotland to provide digital printing onto high quality, luxury products at scale when working with delicate, natural fabrics such as cashmere. It is therefore often necessary to use specialised overseas suppliers for print services, including digital, which adds cost and logistical complexity, and is potentially less sustainable. In this project, we were keen to find out whether advances in digital print techniques and technology would mean that companies could feasibly undertake some of that work themselves, in-house. The second part of the project was more about developing more innovative sales channels through which to target customers directly, opening up new market segments, and keeping pace with changing consumer behaviour. It would be fair to say that we had more success with some aspects of the project than others, but we have certainly learned a lot from the challenges of printing onto cashmere, and the pros and cons of different combinations of preparation and print processes, and intend to develop and disseminate that knowledge more fully. We received some very useful input early on from CMAC, the future manufacturing research hub at the University of Strathclyde, who helped us to gain a better understanding of the chemistry involved in different fabric pre-treatment options. It was, however, more challenging to find partners and suppliers who could provide some of those pre-treatments for us, particularly given the very small batches required for our print tests. For instance, we did not manage to source a supplier of appropriate plasma treatments in Scotland. I think this highlights the importance for textile companies of being able to access good R&D infrastructure on an ongoing basis, and it is worth considering whether higher education could do more to help in the future. It is difficult to quantify the impact of the project at this stage, as our work to identify optimal processes and technology is ongoing. To date, we have demonstrated that with fabrics such as cashmere, it is still very challenging to match the quality of more established production methods. This is useful knowledge, which is likely to influence business and investment decisions. But further research is needed before other significant impacts can be achieved. As a result of the project, we now have an archive of samples that were produced using different combinations of treatments and inks, and we hope that might be a useful resource for the industry. We would like to keep experimenting with novel techniques and technologies, to find out what we can achieve, drawing on our wealth of practical experience and design knowledge. This project has also given us a better understanding of where there are some gaps in our knowledge, and has given us an appetite to explore more collaborations with academics in other disciplines. 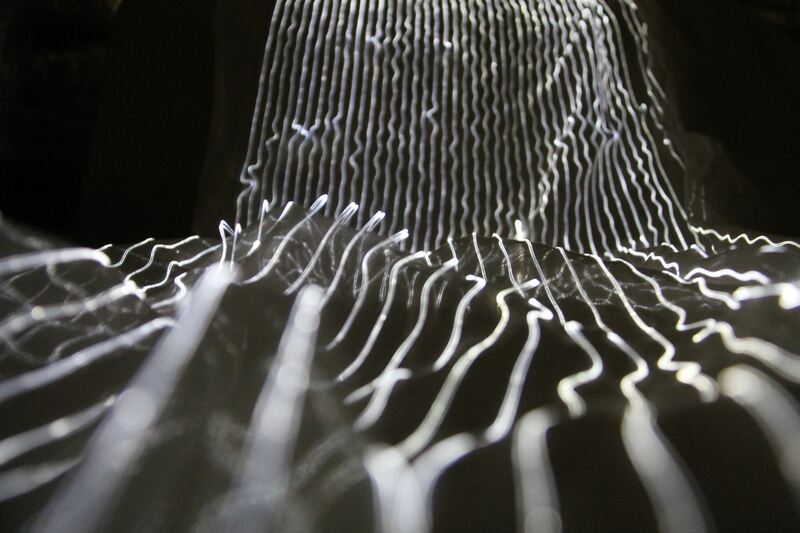 Can you introduce us to the people behind the Light-Emitting Textiles Project? Margo Graham: I am the Design Director at MYB Textiles. I left school in 1982 after studying higher art to take up a lace design apprenticeship of 5-7 years with Johnston Shields & Co Ltd in Newmilns, Ayrshire. I worked there until 1998, mostly designing for Laura Ashley, Sanderson and Anna French. I then took up the post as Lace Designer with Morton Young & Borland Ltd (now known as MYB Textiles Ltd). I was promoted to Head Designer in 2004. and in 2011 I was asked to take up the position of Design Director. In this position I have been involved in the marrying of 100 year old Nottingham lace looms with modern design technology also visiting trade shows and customers globally; specialising in developing the Russian market. 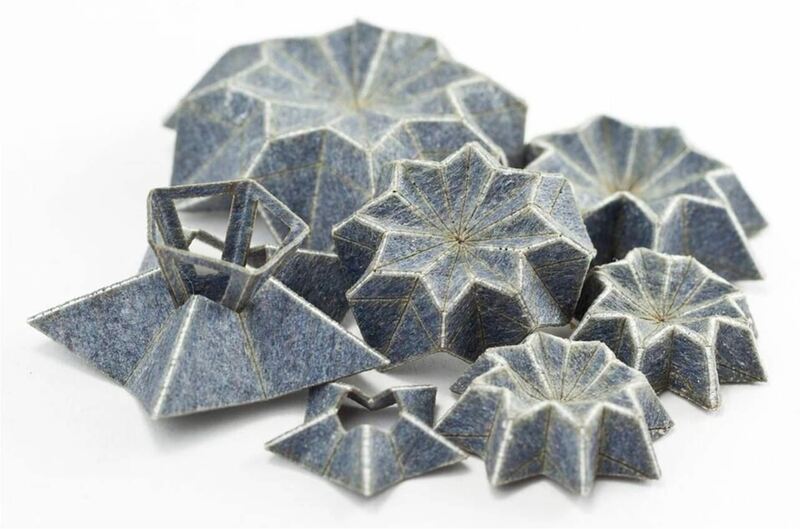 Sara Robertson: I am the Smart Textiles Tutor & Researcher for the new pathway on the MA Textiles course, Smart; Soft Systems at the Royal College of Art. Previous to that I was Programme Director for Textiles and Researcher in Craft Innovation and Smart Materials at Duncan of Jordanstone College of Art and Design, University of Dundee. I have extensively explored thermochromics dye systems over the last 10 years and the design potential of chromic material and digital function. I regularly collaborate with designers and researchers across disciplines, using craft-based exploration to showcase the potential of smart materials. Recent work, Digital Lace (Robertson & Taylor) won the International Symposium of Wearable Computers 2014 Design Exhibition Jury Award: Fibre Arts, showcasing at the EMP building and Microsoft Research Labs, Seattle. Sarah Taylor: I’m currently a Senior Research Fellow at Edinburgh Napier University. I have worked as an academic and research practitioner in the field of e-textiles for over 20 years and specialise in light-emitting textiles. I completed my research degree in 1995 which explored the visual potential of fibre optic technology within textiles. I have a particular interest in the aesthetics of light within cloth and in using different technologies to enhance or activate visual effects or interaction for example. I have exhibited craft-based design work at major national and international exhibitions over the years and have worked in collaboration with experts from other design and technology disciplines and have enjoyed the diversity of working on a range of cross-disciplinary projects. Margo: We received Challenge Funding to attempt to weave with fibre optic yarn which can be illuminated after weaving. Sara: Sarah and I have been lucky enough to work on two, interrelated projects supported by the Challenge Funding with Margo and the team at MYB Textiles. The first project was an early stage, proof of concept project between MYB Textiles and the University of Dundee. The aim was to develop the capacity for manufacturing smart textiles using optical fibre as light-emitting lace. To be able to do this within a traditional Scottish textile manufacture infrastructure was really exciting and unprecedented. Sarah: The results from this project prompted the second research project at Edinburgh Napier University in conjunction with lighting design and manufacturing experts, Mike Stoane Lighting. The second Challenge Funding allowed us to develop appropriate lighting systems to illuminate the woven optical fibre lace. This meant we could maintain full weaving capacity which had been previously compromised due to the need to make design adaptions in production when using conventional optical fibre light sources. Our main focus was to develop a lighting system as a fully integrated component of the woven product. Margo: After speaking to Hotel group contacts, which are always on the lookout for more technical innovative textiles that can be used in bars, restaurants, night clubs etc., they were very positive about the use of such a product in the correct setting. Sara & Sarah: We’ve been really encouraged by the responses so far from leading design companies. We also think it’s important to provide a competitive platform for Scottish Textiles within the smart textiles global market. 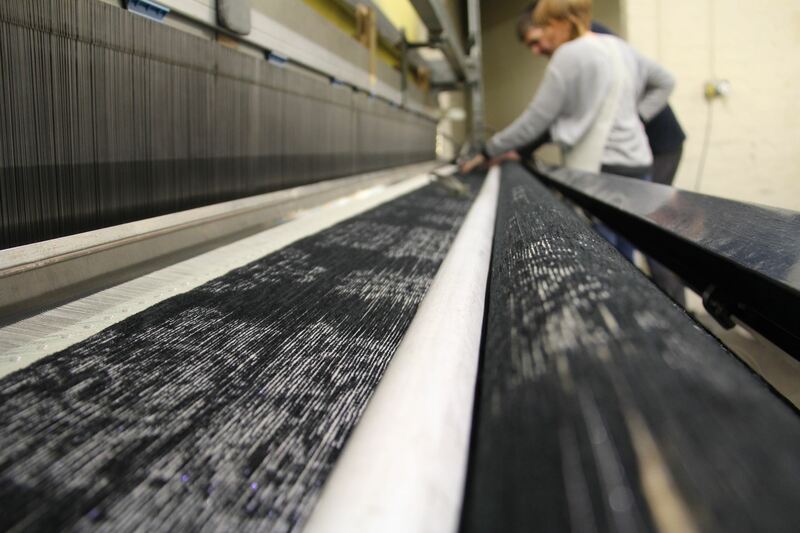 Margo: We have been very successful in weaving our madras (Scotch Leno gauze weave) fabric with the fibre optic yarn, learning that the different weave effects generate different light emission. Unfortunately our large 9m lace looms were unsuccessful in weaving with this fabric as the construction of the weave bend was too severe to let the light flow through. Sara & Sarah: Based on the successful results from the madras weaving trails in Project 1 and our recent lighting developments (Project 2), we now have the capabilities for large scale weaving production and specialist know-how. Thanks to the team at Mike Stoane Lighting, we are not bound by size limitations of traditional fibre optic lighting systems, or the ways in which existing commercial woven optical fabric is lit. Margo: Given that we have worked with Mike Stoane Lighting on this project to find the best way to illuminate the fabric, this project will be beneficial to both Scottish companies. The fibre optic yarn is also produced at UFO in Coldstream, helping to secure employment and hopefully further job opportunities. It is also projects such as these that put Scotland at the forefront of Textile innovation that it is renowned for. Sara & Sarah: Each project has brought unique design elements together. The finished product is a celebration of exquisite (and exclusive to MYB) Madras fabric and bespoke lighting design manufacture. We think it will open up potential benefits for both the lighting and textile markets, and we anticipate future economic value and impact once the product is launched. Margo: We are confident that the product is now ready for rolling out for production. It can be woven in panel sections of 100cm, 50cm or 15cm. Mike Stoane Lighting is planning to showcase the fabric with his logo at the Light & Building exhibition in Frankfurt in March 2018. We are hoping for positive feedback from this exhibition. Sara & Sarah: We hope the launch of the first light-emitting fabric to be woven in a Scottish heritage mill will generate a lot of interest. We’re lucky because we have a great team who are committed and who share the same vision to continue with this research. We’re excited about the future. This is just the start! Thanks to TFF for supporting our projects, to Universal Fibre Optics (UFO) for their generous material sponsorship, and to the rest of Our Team: Dave Hollingsbee and Graeme Wilson from Mike Stoane Lighting, Scott Davidson, Simon Grant and Charles Lamb from MYB Textiles and Malcolm Innes from Edinburgh Napier University. Can you introduce us to the people behind the Antenna Array project? Dr Symon Podilchak was born in Toronto, Canada, and has a B.A.Sc., M.A.Sc. and a Ph.D. degree in Electrical Engineering. From 2013 to 2015, Symon was an Assistant Professor at Queen's in the Department of Electrical and Computer Engineering as well as a Natural Sciences and Engineering Research Council of Canada Research Fellow. He is also a registered Professional Engineer in the Province of Ontario and the founding chairman for the IEEE AP-S/MTT-S joint chapter in Kingston. Symon joined Heriot-Watt University as an Assistant Professor in 2015 and became an Associate Professor in 2017. Symon's industrial experience includes modelling the radar cross-section of military vessels for high frequency surface-wave radar, professional software design and implementation for measurements in anechoic chambers, design of compact multiple-input multiple-output antennas for wideband military communications and automotive radar, and the research and development of highly compact circularly polarized antennas for microsatellites. Dr Constantin Constantinides received his Ph.D. in signal and image processing from the Telecom Paris Tech School of engineering, Paris, France in 2012 and his Master’s degree from the ESME-SUDRIA School of engineering, Ivry-sur-Seine, France in 2008. From 2015 to 2016 he was a research associate at Heriot-Watt University in Edinburgh, and from 2012 to 2014, he was a research associate at the ESME-SUDRIA school of engineering. His work in antennas involves original contributions including beam-steering leaky-wave antennas, textile antennas for search and rescue, miniaturized antennas for Nano satellites and retro-directive arrays. Currently he is an RF Engineer at PocketCube Shop in Glasgow, Scotland. Rahil Joshi received a B.E. degree in Electronics and Communications Engineering in 2014 from Birla Institute of Technology and Science, Pilani-Dubai Campus. In 2015, he received the M.Sc. degree in Communication and Signal Processing Engineering from Newcastle University, UK. He is currently working towards his Ph.D. degree at the Institute of Sensors, Signals and Systems from Heriot-Watt University. His research interest includes compact and wearable antennas, wireless power transfer in the near- and far-field, and software defined radios for wireless communications. Rahil has worked on projects such as GPS signal acquisition in hostile environments, sensor networks, and the implementation of wireless receiver algorithms. He received the Associate Fellow designation from the Higher Education Academy, UK in 2017, and in October 2017, he received an award for his research work during his PhD from Heriot-Watt University. Ping Jack Soh received his B.Eng. and M.Eng. degrees in Electrical Engineering from University Teknologi Malaysia in 2002 and 2006, respectively, and a Ph.D. degree in EE from KU Leuven, Belgium in 2013. He is currently a Senior Lecturer at the School of Computer and Communication Engineering at the University Malaysia Perlis, and the Deputy Dean of the University's Research Management and Innovation Centre. During his Ph.D. he was involved in antenna design and characterisation for AGFA Healthcare, Mortsel, Belgium, which resulted in a filed European patent. His research interests include the design, development and modelling of flexible, textile, conformal and planar antennas, on-body communications, metamaterials and microwave measurements. Dr Soh was the recipient of the IEEE Antennas and Propagation Society (AP-S) Doctoral Research Award in 2012, the IEEE Microwave Theory and Techniques Society (MTT-S) Graduate Fellowship for Medical Applications in 2013 and the International Union of Radio Science (URSI) Young Scientist Award in 2015. He was also the second-place winner of the IEEE Presidents' Change the World Competition and IEEE MTT-S Video Competition, both in 2013. Two of his authored journals were also awarded the CST University Publication Award in 2011 and 2012. He has been a Senior Member of the IEEE since 2015 and serves as a member of the IEEE MTT-S Education Committee since 2014. This project work was based on the concept of wearable antennas and connecting electronics, for smart technical textiles and clothing. These devices are wearable Radio Frequency (RF) components that are specifically designed to function while being worn by a human being. Some of the commercially available products in the market today are Google glass, GoPro cameras, smartwatches, etc. Other applications of smart clothing, as investigated in this Challenge Funding Project, include search and rescue operations and emergency communications. In these applications, these radiating and communicating devices can be fully integrated into clothing and can potentially become wet due to water exposure. For example, when a member of the coast guard jumps out of a helicopter during a rescue operation, the communicating RF devices that are worn by that rescuer are still needed to operate. It should be made clear that this is very challenging RF design work since the wetness clothing factor, can completely change the operating performance of the radiating antennas and electronics. In this project two wearable antennas were designed and tested for military search and rescue operations and emergency communications. The idea was to integrate these antennas into the clothes or the jacket of a soldier, a reporter, and/or medic. Communicating and tracking of such personnel in the field requires an antenna working at UHF (the Ultra High Frequency band) for satellite connectivity, and as such an antenna for this operating frequency was designed, fabricated, and experimentally verified. The other antenna designed, for data exchange between individual personnel requires antennas working at the ISM (industrial, scientific and medical radio) band which is about 2.4 GHz. This frequency is similar to Wi-Fi frequencies and can be applied to this application as well. These wearable antennas were designed to be compact, low profile, low cost, light weight, flexible and resilient to this harsh operating environment. These antennas were also tested in these conditions and were proven to operate as per design. It should be mentioned that this is extremely difficult antenna and RF engineering work due to the size constraints and flexibility/durability requirements. 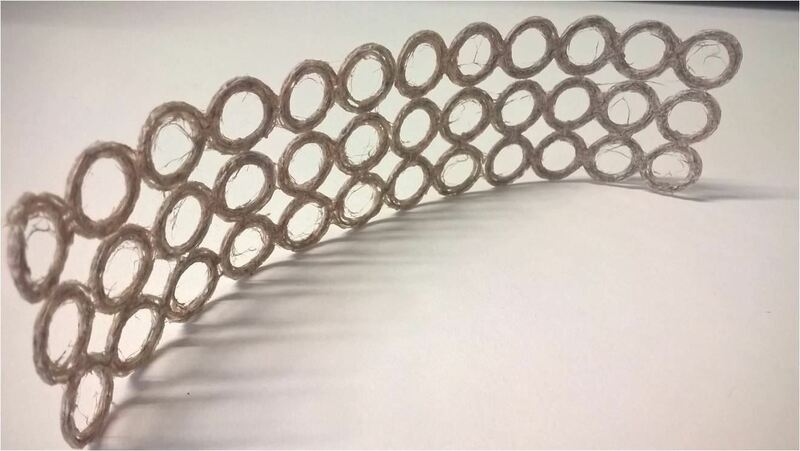 Additionally, a flexible textile-based RF cable for feeding such antennas with communicating signals was also developed. 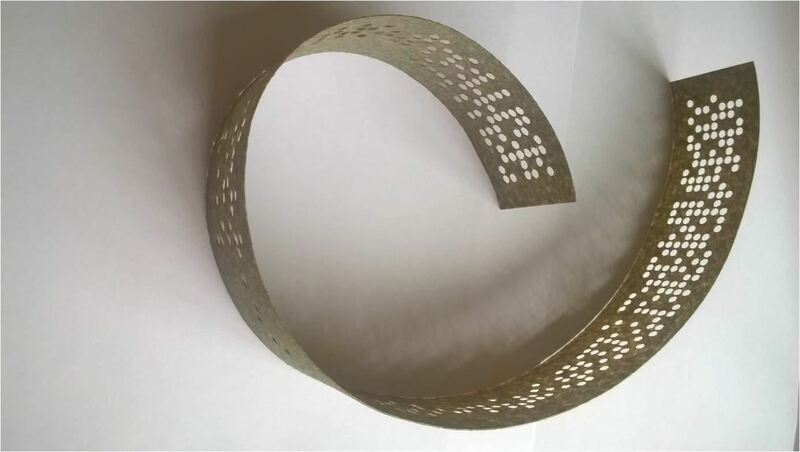 This RF textile-based cable could be placed within a T-shirt or a ballistics jacket for RF connectivity. It was also tested and shown to work in these same harsh operating environments for search and rescue operations and emergency communications. Illustration of the wearable antennas and the feed system for integration into a ballistics jacket. Over past two decades body centric wireless communication has become a major part of human day to day life. Also, the utilisation of wearable textiles devices for communication applications is on the gradual rise due to recent miniaturisation of wireless RF components and other mobile devices. The textile industry is already planning to work on smart clothing and this project proves that an idea to implement RF devices in clothing is possible. We have developed two antenna prototypes which are operational at 400 MHz and 2.45 GHz respectively. These antennas were developed for military search and rescue operations. Robust tests such as bending, twisting and temperature tests were performed to check the durability of these antennas. Beyond the end of the Challenge Fund, we have further enhanced the original textile-based transmission line to use a different material, and this new configuration had reduced losses when compared to the original prototypes. Now research work continues, and Rahil Joshi is completing a PhD on this topic. Additional developments are underway which continue from the original Challenge Funding project work. It can be argued that the generation of new ideas and technologies can contribute into economic growth. The novel idea to embed antennas and transmission lines into clothing will contribute towards the expertise of the textile industry in Scotland as well as other industries such as defence, clothing, and medical. This is because industrial members of the project consortium are from Scotland. J&D Wilkie and Leonardo, respectively are textile and defence companies. This may give rise to new start-up companies. Also, the protection of the generated IP is of interest. For example, J&D Wilkie are considering patenting the design for the textile-based transmission line. In addition, the research work completed thus far, trains researchers to be experts in this area and thus they can further contribute to the development of new ideas and textile RF devices and whilst further interacting with these industrial partners which are based in Scotland. - Publishing the new textile-based RF work in IEEE journals. - Patent the textile-based transmission line concept. - Further optimization of these antennas can still be performed in terms of making the structures more compact. - Extend the new textile-based transmission line to other RF applications. - Seek additional funding to support and continue the project. My name is Paul Allan. I am an Environmental Project Officer for SLG Technology. The project we received challenge funding for was to take end of life leather seat covers from aircraft, and turn these into energy in the form of heat which could be used to manufacture new leather seat covers, following the circular economy model. This project was a partnership between Scottish Leather Group, Ulster Shredders and University of the West of Scotland. These seat covers would typically be sent to landfill, by processing the seat covers we were able to prevent them from entering landfill and capture energy from them to create new product, thus lowering the carbon footprint of the product at the start and end of its life. We achieved this by gasifying the seat covers in our Thermal Energy Plant via pyrolysis, the seat covers were shredded to <30mm to increase efficiency of the gasification process. This project is important to the textiles industry as it is a working example of the viability of the circular economy model in action. With the help of the Challenge Fund: we successfully shredded, gasified and captured energy in the form of heat from end of life aircraft leather seat covers. The biggest impact this project has achieved is proving the viability of the circular economy principle in the textiles industry. We also diverted a significant quantity of material from entering landfill and generated energy that was used for the creation of new products. The project has proven viable and there now exists the potential for commercial arrangements for take back of end of life leather seat covers to generate energy for creation of new seat covers and avoidance of landfill. My name is Sabrina Malpede, I am the Executive Director of ACT Blade. Prior to that I co-founded SMAR-Azure Ltd, providing innovative solutions to the marine industry. I was a Research Fellow at Imperial College London, and hold a Ph.D in Aerospace Engineering from the University of Glasgow. The project intended to experimentally validate the use of the textile for wind turbine blades. The experimental tests included wind tunnel tests of a textile model at the University of Glasgow, and textile material tests including hail gun and rain erosion tests at the University of Heriot-Watt. We also assessed the textile companies’ capabilities in Scotland. The Wind Energy industry is on a mission to lower the cost of energy. The easiest way to reduce that cost is by developing larger turbines and longer blades. This textile enables us to make blades lighter and therefore creates an opportunity to build longer blades. Considering that the industry is worth more than £6billion per annum, we believe this is an extremely worthy project for the textile industry. We managed to assess the Scottish capabilities. We have also managed to understand some important features of the aerodynamic performance. We had a few textile material results. To date, the project has clarified that we need further investigation. The company had to raise fund and has created 9 jobs on the process. What does the future look like for your project? The next steps are building the first demonstrator and prototype and consequently piloting it. My name is Gordon Paul, I am Group Head of Research at Devro. I was previously in academia where my main research activities were in the area of collagen biochemistry. I am interested in understanding processing of collagen, its basic properties and possible commercial uses. We received funding to investigate the use of collagen from in various parts in our process to make a new type of fibre from which novel textiles could be made. It is something new and had the potential to open up new markets in the textile industry. We managed to show it was feasible to make unique fibres with interesting properties on a laboratory scale. This was an early stage concept project and such impact cannot be estimated at present. It is not our core business and any further involvement would need to be through collaborative agreement with others. This is being investigated. Can you tell us a little about who is behind this project? This is a collaborative research project by members of staff from Heriot-Watt University: Jim McVee and Danmei Sun from the School of Textiles and Design, and Aimaro Sanna from the School of Engineering & Physical Sciences. I, Jim McVee, have around thirty years’ experience in commercial textiles, seventeen of those in Textile Testing Quality Control and Product Development. I have worked for Peter MacArthur of Hamilton whose client base included Ralph Lauren, Burberry, Gap, Gaultier, and M&S. I also worked for MacNaughton Holdings in Perth for seven years as QC Manager covering a wide product base from Highland wear to Contract Upholstery. We have received funding to trial the conversion of wool waste in to energy and high value by products. All traditional textiles have the same types of waste and companies are losing approximately £400k annually. We have a working bench top prototype and have proven concept, and have filed for patent. 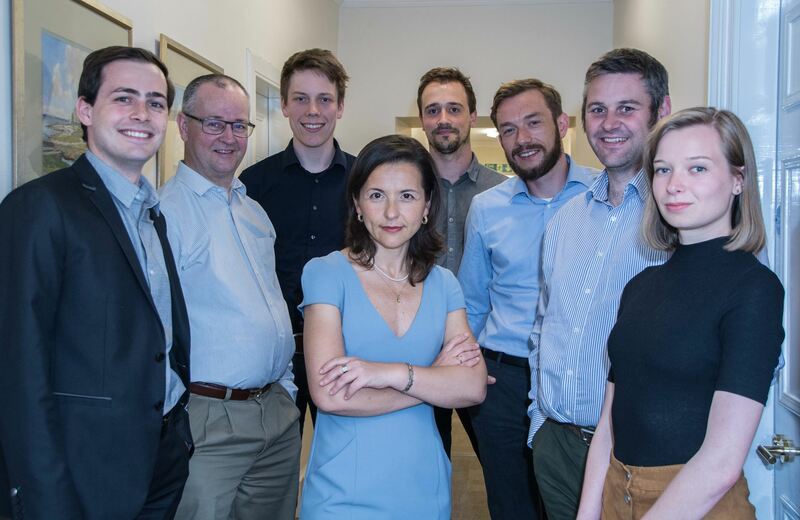 We have secured a bridging fund from the Energy Technology Partnership, and will hopefully be successful in being awarded KTP which is the final step before commercialisation.